Does anyone else rocking a case go back and forth about being brave enough to go naked I want to but am scared to.. I started out with a case for about a week. I took the case off and have been without one for 2+ months now. I just added the Zagg Glass screen protector (but it's not fitting perfectly around the edges, there are other posts about this). I REALLY like not having a case. I'm very careful with my phones. I also go back and forth. The only time I take the case.off is at home. I don't trust myself at work, or outside. Just installed the zagg hdx, and really like it. No halo effect..
sforsyth01 and akutch34 like this. I just got mine. Came with an s-view case that drove me insane so I took it off. Love the feel of the phone without a case but I don't trust myself, so I ordered the Spigen Capella. kevinpleasants, mayconvert, FullAuto67 and 1 others like this. I hate cases as well but, coming from a Moto X, the Note wasn't as comfortable to hold so I bought a slim Bear Motion case with a nice grippy sand finish. It doesn't do much to protect the phone, I don't think, but it feels very nice in hand. Jadien, rvhs03 and jlczl like this. I switch back and forth from my Sview case and incipio. Sview kind of feels naked but I'm always careful with my phone. I have a couple of cases as well and hate using them but I also hate the sharp edges of the phone while not using a case. I have the Otterbox Defender for the rough stuff but found a 0.3mm clear gel case on ebay for a couple bucks. It's as thin as can possibly be, and protects the chamfered edges. It's perfect. I prefer no case, but I wore the coating off my last phone's screen and it became a smudge nightmare. I actually hate screen protectors more than cases, so I am got the S-view wireless charging case. So far I love it. Very minimal, and I feel like it protects the screen really well. I am a big fan of wireless charging, so it worked out well. I love the feel of the phone caseless but currently using a Spigen Tough Armor case. I take the case off at home but always have it cased when out and about. Can't risk dropping this beauty. Samsung shell case. Perfect fit, thin and good feel. Tried the flip case and did not like it. First of all the flip view covers view area is vulnerable to scratches, I scratched my Note 3's, then had Ghost Armor put on...they aren't in my locale any more so w/in 2 weeks I had 2 scratches on my Note 4's so went to the mall out of frustration.....they had a similar service, so I had them put a protective film on the outside of the viewing area......second issue is the flip view does stay closed if dropped, so that defeats the purpose....I got Spigen's magnetic attachment for the flip view case and it works great.....I LOVE the case I like the way it looks and works. Otter Box - Commuter. No screen protection. Have never used screen protectors and never had a problem. And I've been rough with my phones. Didn't like the feel of the naked note 4. Same here, OB Commuter with no screen protector. I like the OB Commuter more and more now. The look and feel are very solid. Same here. Otterbox Commuter with no screen protector. 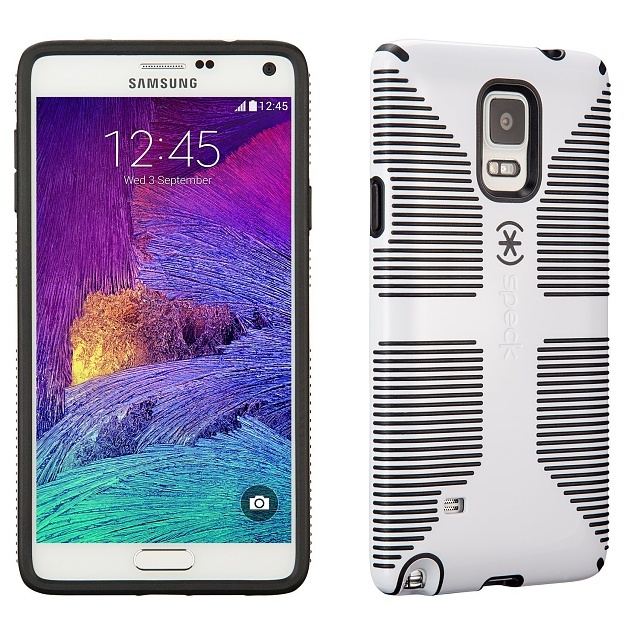 I've REALLY want to use my Note 4 without a case, and I have tried. BUT, I just don't like the feel of the phone naked. It looks fantastic, but it just doesn't feel good to me. The back is too slippery and it's almost too thin to hold comfortably. I've been thru many cases and finally settled on the Speck Products CandyShell Grip Case . It's pricey, but has an great feel to it. I'm always using my spigen case. I don't like it. But I'm to scared that I will damage the camera lens if I go naked. I also use the Speck Candy Shell Grip case and I love it. It doesn't add too much weight or thickness, and everything is protected well. White Note 4. Too Beautiful to cover it up with a case. Don't even own a case. Music on my phone has no artwork or changed to a random photo?